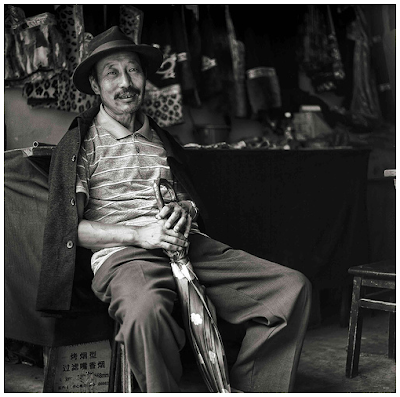 "A Glimpse of the World" (Howard French): The local tailor. Danba, Sichuan Province. October 2006. Rolleiflex 2.8, Ilford Delta. For me personally, one of the important outcomes of the "Jonathan Greenwald: Conscientious Street Photographer" thread was a modest comment that included a flickr link from someone calling him- (or her-) self "A Glimpse of the World" (hereinafter referred to as Glimpse, with male pronouns, and apologies from me if the latter is incorrect). Glimpse apparently prefers not to be known, but has amassed an impressive amount of unusually fine work on flickr—I've returned to his page three times over the past few days, each time discovering more to look at. He practices a sort of street/travel/environmental photography in various cities around the world, and has a fine eye for honest documentary and found portraiture. You'll notice that he switches formats (35mm and medium format), cameras, and films, and mixes black-and-white and color. I normally find that photographers who do this create an obstacle for themselves that's difficult to overcome, with the technical inconsistency fracturing the integrity of the message. (It's difficult enough to create, and conform to, a consistent style in photographs.) While I still have some reservations about Glimpse's work in this respect—at least as it's presented on flickr—I think his vision survives the self-imposed handicap pretty well. See what you think. Mea culpa: A number of commenters have (correctly) identified Glimpse as Howard French. I don't know why my reportorial/researcher abilities abandon me whenever I get on flickr, but it's happened before. For some reason I seem to have a congenital lack of affinity for the flickr interface—the pictures are too small, navigation confuses me, and I never seem to know exactly what the heck I'm doing. I swear I looked for Glimpse's identity on flickr for 15 minutes before concluding that it just wasn't there, hence the title of this entry. What can I say? Write it off to my incompetence, I guess. Howard W French is a "senior writer for the New York Times". Glimpse's best stuff is very good indeed. Thanks for pointing her out, Mike. I suppose I should be grateful that Flickr offers a way to see such work, but truth is I always find viewing photos on Flickr fairly unpleasant. In the case of a photographer like Glimpse, I wish I could see photo essays on magazine pages with the kind of authorial voice and editorial organization that pulls work together. Furthermore, a number of Glimpse's photos absolutely deserve the intimate, prolonged viewing that work on paper invites. Perhaps Flickr will open doors to publishing for Glimpse (if he's not already through them). But I wonder how much the Internet has diminished the chance that we will view her work on anything but Flickr? His site has his writings as well as his photographs. It's worth a look. "See the entire gallery at: howardwfrench.com"
How can anyone second guess the "technical inconsistency" of a photog in the current era? I mean with technologies changing everyday, film dissappearing, and new digital techniques, I don't think any photog can be consistent... if you try and just lock into one style, one camera, or one system, it's nice, but every photog who isn't fractured now, will likely be in <5years. There is just too much going on. I had a couple good long looks as well. Very fine work IMO. BTW Mike: I find it comforting that I am not the only one who finds Flickr a challenge. That thing makes me feel like an idiot! flickr rocks and it's so big it makes you humble realizing there is so much current good work out there. I've enjoyed Howard's work for about a year now. Nice find. I too find flickr confusing. I did subscribe for a few days but gave up with it. Howards images are very good. I'm not understanding the link between multiple formats/mediums leads to being a hindrance. I find some situations need something else. I use 6x4.5 6x6, 35mm, dSLR, k14, e6, c41, silver. Makes no difference to me. Just use what i feel like using. Howard's work is quite excellent. Regarding flickr: I thought I was the only one who finds its interface annoying. I echo the sentiments of the flickr site. When I am directed there I just groan with all the enthusiasm akin to being sucked to death from the feet up by a crocodile. ie at the beginning something must be going on there but all I feel is aggravation. If you find Flickr confusing could you suggest some other sites that you like ? "with the techncal inconsistency fracturing the intergrity of the message"
I know what you mean Mike, but is it unfair to make an analogy to a painter who works with oils but also makes sketches with charcoal or a humble pencil? Also I think that when one switches formats -or goes from colour to black and white -the results can be eclectic and funky. Plus it's just plain fun! PS And French's photographs are very good. Do you think Mike, that shooting with as portable camera as Rolleiflex TLR demands different approach than shooting with 35mm? I belive a Rolleiflex is that kind of magic, that can beautifully complement one's small format work, and parallelly other's LF work. Editorial usage is generally recognized under the principle of Fair Use. You don't have to pull the image. Personally, I dig flickr alot. I'm trying to figure-out how he decided if a photograph needed to be B&W, or color? Engaging stuff though. I dunno, looks to me like just decent pictures of random people. I prefer pictures with more... pictorial content. I feel lost on Flicker too.. I very much enjoyed looking through some of Howard French's images. I had looked at his work a few months ago, having encountered him on (I think) the Leica forum. I think he has a good eye for spotting a frame and he'll probably continue to get better with age. Count me among those who are not fans of "Flikr". I've never liked the user interface nor the forced smallness of the images, nor the navigation. It's also a place that seems geared for those who want to be part of some "community" centered around each others' snapshots. "Flickr" just feels very young and more socially oriented than I care for, but I'm sure that the chatter is what keeps the traffic high. I liked the Howard French stuff. I don’t see a style problem shifting between formats, B/W or whatever, but as for Flickr I have to admit I haven’t been very impressed with it so far. I have meant to sign up a couple of times, most recently when I wanted to participate in one of Strobists shoot, show and tell excercises. Strobist himself raves about flickr, so I’m sure there must be something to it, but I haven’t seen it yet. Perhaps you can load large pics and setup a good clean layout, but all I have seen is small pics on layouts that are confusing and usually distracting from the photos. Someone got a good example of a flickr blog? I’d like to look. Sparse layout, with up to 2000px maximum width (not LESS than 850 wide recommended and no having to go to a blank white page to see larger versions). It wasn’t until I had signed up that I realised it was a One Per Day site, which concentrates on THAT day’s photo by the members. Despite this, I do still like it. The relentless pressure to get up a new picture each day is great incentive for getting out there and shooting. You can still use the portfolio as a gallery http://lazyaussie.aminus3.com/portfolio/ if you want to use it that way. The community page http://lazyaussie.aminus3.com/community/ is a random selection of that day’s photos. The bad things about it are that there is little or no critical comment. You only get positive comments rather than helpful criticism, so there are maybe a few too many cat and flower shots getting rave reviews. There is also little or no tech talk about the images, and there are no self defined categories. Top'ers may find it interesting nonetheless. Thanks very much for noticing the work, Mike, and to everyone for their generous comments. Flickr can be a bit of a maze, but for me it has become a fun and indeed very useful part of my life. Fun because with a little practice one learns how to track photographers whose work is consistently interesting, and the visual education one gets from following a few dozen people as they work and evolve is really useful. Useful because although I have a website with formal galleries, I don't have the time to update them as much as I would like. Flickr lets me post current work as often or as seldom as I'd like, and with little fuss. I am preparing a photography-only website, which I hope to have online before too long. My Shanghai work has shown here and there, and I've begun to be able to sell some prints, which is very fulfilling, as anyone who has done so can attest. Some responders have mentioned the possibility of a book. That is, of course, the ultimate goal. I feel my Shanghai project is mature, and the neighborhoods I've focused on these last two years will all very soon be completely gone. Any suggestions or contacts with publishers would be highly welcomed, and for that, or for prints, you may contact me off-line at globetrotter@howardwfrench.com. Finally, Mike, I'd be happy for you to post an image here. Please do. Thanks for putting Howard French's work under my nose. I like them. And Flickr -- well, Flickr's a PITA; and a right royal one at that. I would think a TLR ideal for un-obtrusive street photography when the majority of street shooting now seems to be done at arms length, peering at a small screen. With head bent down most people likely wouldn't know what a TLR user was about, meanwhile he has the advantage of that big 6 x 6 screen, enough to make 7D users weep ! Well I don't think the "The local tailor" from the picture that illustrates the post doesn't know what a TLR user was about. I'd like to nose in here again on a couple of questions. First is Flickr. I have no brief for Flickr, but I think most of the comments about it have been really ill-informed. Flickr is exactly what you will make of it. It's very flexible and I mean that in multiple regards, from allowing you to decide what size to display your work in (I limit mine because I don't people downloading print-quality files), who will see it, whose work you will look at, etc. etc. You can find your own universe of high-level shooters and have their word and only their work fed to you as they post it, or you can troll more indiscriminately, looking at plenty of forgettable images, but also stumbling now and then on real gems by people whose work you'd never see otherwise. You can get involved in chatty groups, or you can abstain. You can comment on other people's work, or not. That, in a nutshell, is what Flickr is. You tailor it to your own tastes and needs. That's that. Thanks to Ken Tanaka for allowing me a chance to improve as I age. At almost 50, I was seriously concerned about that. On the question of switching cameras and formats, my display work is overwhelmingly shot in black and white with the Rolleiflex. I have a 50-image catalog of my first solo show, which took place in Berlin last October if anyone's interested (write me). It's exclusively medium format b+w. I switch around in part because I'm all about growth, and I don't like barriers. I'll never tire of my Rolleiflex and b+w film, and have by a very large margin the highest ratio of keepers with it of any of the many cameras I've owned. We connect. That said, I enjoy shooting rangefinders. I feel like a functional illiterate with color, but that's part of the fun and the challenge. And I like the digital darkroom, approximating and refining processes that are analogous to the wet lab I grew up with. I bought an M8, in part, because I've got a demanding job in the "real world" and I thought that if I could break myself in with it, I could save a lot of darkroom and scanning time and eventually produce interesting work. I think I'm getting there, by the way. I'm not at my Rollei level yet, but bit by bit, it's coming, even in color. Howard French: "Thanks to Ken Tanaka for allowing me a chance to improve as I age. At almost 50, I was seriously concerned about that." Hey whipper-snappper! [grin] I'm over 50 and I'm still trying very hard to improve with age! Different cameras, different ages, different eyes.